If you are looking for a new VPN service then why not try out SlickVPN? SlickVPN could have become one of the most well-rounded VPN service providers available in the market today. But the little details do matter a lot in the VPN industry where the competition is as fierce as in any other industry. You’ll find out soon enough why SlickVPN still has some way to go if it wants to compete with the likes of IPVanish and NordVPN. From an overall perspective, SlickVPN offers many server locations and has a really robust VPN client. It also makes use of good security protocols to ensure user privacy and anonymity. Without going into too many details, SlickVPN offers a single package. The price of the packages varies by the time period for which you sign up with SlickVPN. The more you pay, the more you increment your subscription package time period with SlickVPN. Of course, the longer the period of your subscription, the lower rates you will pay. With that said, SlickVPN has four types of packages. As mentioned before, all the packages are basically the same. The only difference between them is the amount of time they allow you to use SlickVPN as your preferred choice of VPN service provider. The first option is the yearly option which allows you to use SlickVPN and all of its features for a period of, you guessed it, one year. This is the cheapest option available where you only have to pay $4 per month. SlickVPN will charge $48 you once after each year. If you decide that you’re not ready for the long haul yet then SlickVPN has the monthly package for you. In the monthly package, you have to pay SlickVPN $10 per month. Again, SlickVPN will charge you the amount once every month. There is also the three-month option if you are confused about whether you should commit to SlickVPN for a shorter time period or a longer one. In the three month package, SlickVPN will charge you around $20 after every three months. That comes down to $6.67 per month. The final option is the six-month package. Here you only have to pay $5 per month. Again, SlickVPN will charge you $30 after every six months. As mentioned at the top, the best value for money package is the yearly package. It gives you a massive discount over the monthly charges of SlickVPN. You don’t us to convince you that SlickVPN is cheap. Especially when you sign up for its yearly package. The industry average is around $6 or $7. But SlickVPN beats that with its $4 price tag for the yearly package. With SlickVPN you have sufficient payment options. Bitcoin is great if you want to ensure your anonymity from the beginning of the sign-up process to the point where you log in to SlickVPN client to connect to one of its VPN servers. Regardless, SlickVPN doesn’t require much information from the user in any case. All you really need to give them when signing up is your email address and a password. SlickVPN respects the privacy of the user. With Bitcoin, you only have to give your password and not even an email address. If you want to use a credit card to pay SlickVPN then you have to provide more information. Again, SlickVPN doesn’t request the user for a billing address or a full name. All SlickVPN packages come with a 30-day money-back guarantee. That means, if you sign up for a package and aren’t satisfied with the service, then you can request a full refund within thirty days of your purchase date. That’s all you really need to know about SlickVPN as far as finances go. Many sources say that SlickVPN operates a relatively complex business structure. Well, they make use of several Offshore Holding Companies along with Operating Companies and Subsidiary Holding Companies to do their work. As far as marketing objectives go, SlickVPN is strictly a US-based VPN service provider. But the operational part of their organization is based on the island of Nevis. Where is the island of Nevis? Well, this island is located in the independent federation of islands far away in the region of West Indies. So what about your information? In other words, what happens to it once you provide any and all information to SlickVPN? Well, according to official sources, the systems that process all user information are located in and operate under the laws of the United States of America. And when something is subject to American laws, you know that you’re going to see some problems as far as your privacy and anonymity is concerned. What About Number of Simultaneous Devices? SlickVPN allows users to connect up to five devices with just one VPN account. Moreover, you can have those five simultaneous VPN connection from a total of two different online IP addresses. As far using IP addresses at the same time goes, the number “two” is more than enough for 90 percent of the users. Well, they mean that with SlickVPN you are free to connect the PC and tablet in your home to SlickVPN as well as your smartphone with its data network. And you can do all of that at the same time if such a need arises. SlickVPN offers all users with VPN servers that are located in over 28 countries. Moreover, it provides more than 60 VPN servers in those 28 countries. As far as number and variety of VPN servers go, SlickVPN is pretty solid. As far as encryption technologies go, SlickVPN offers a strong 256-bit OpenVPN connection by default. It also uses the AES cipher. This makes its encryption implementation method very secure. Moreover, it couples that up with a 128-bit IPSec and PPTP VPN connections. SlickVPN itself recommends users that they should use OpenVPN whenever it is possible. OpenVPN is the most secure and reliable VPN protocol of all VPN protocols. So you don’t have to take risks with other protocols. How does it handle its Hash authentication? It handles that with a SHA-1 and, similarly, handshake via a 2048-bit RSA. The AES 256-bit encryption would have alone made SlickVPN a secure VPN service but the whole setup makes it one of the most secure VPN service provider in the market today. SlickVPN has updated its VPN service with the new Hydra feature. Basically, Hydra is a multi-hop gateway that goes through VPN servers located in Washington, DC. It may or may not go through other portal areas as well. Hydra routes the user’s VPN connection to another portal which is different from the first portal. Then, from there, it constantly feeds the user’s VPN connection before finally connecting the user to the internet. If you didn’t understand any of that, then know, that because of Hydra your IP address is more obfuscated than ever before. Hydra also further encrypts the user’s VPN connection. In fact, some sources say that SlickVPN encryption is so strong (partly because of Hydra) that SlickVPN makes the user’s VPN connection almost uncrackable. Of course, nothing is uncrackable. Provided that a worthy adversary is after you, you can’t really hide for long. By that, we mean that if a government decides it wants to go after someone, like Snowden, then a technology like that of Hydra would matter little. The US government agencies can even see through the Tor network. So VPN service providers aren’t a big deal for them provided they know who to look for. We have heard quite a lot about the legal problems of SlickVPN as a VPN service. Perhaps we shouldn’t say problems. Only that SlickVPN has a complex legal situation as a VPN service provider. In other words, the situation is confusing and unclear. As we have already mentioned, the company has lots of divisions. And these divisions, as expected, divide the operation of the company into different subsidiary, operating along with offshore companies. With that said, we can confidently say that the majority of their operations are subject to United States laws. That means that SlickVPN does come under US jurisdiction. Of course, users will have many concerns about a VPN service provider that is based in the US. But you don’t have to worry as far as SlickVPN is concerned. Because SlickVPN has taken good measures to avoid a potential US government interference in their operations. Well, first, it has a no-log policy. And it also maintains that Warrant Canary that all new VPN service providers keep talking about. Now, a Warrant Canary for a VPN service based in the US? The company updates its Warrant Canary page after every two weeks. It is also PGP signed. ALl of this means that if the US government asks SlickVPN for user information it can warn the users of such request. And if it gets hit with a federal gag order, then too it can inform its user base. For us, that is reassuring. We only hope that SlickVPN continues to offer this feature in order to maintain the high standards of privacy and anonymity that it has held so far. Moreover, these measures also show that SlickVPN is very serious about protecting user privacy. SlickVPN does not block its users from using P2P technologies to share and download files. In other words, there are no restrictions on peer-to-peer traffic. You may use any of the different file-sharing software applications and platforms on any of SlickVPN VPN servers. But there is one “restriction” though. You can’t send email messages by using SMTP when you are connected to a SlickVPN VPN server. But that is something all VPN service providers do hence SlickVPN doesn’t lose marks for this restriction. As we have mentioned countless times before, we think that the official website of any VPN service provider is one of the features that the VPN service provider, knowingly or unknowingly, offers. If the official website doesn’t look good and works efficiently then potential users would face difficulties in signing up for the services and finding out the solutions to their problems. They will move to the VPN service provider that does have a nice looking and functional official website. So having a great official website is essential for any VPN service provider that is looking to survive more than a year in this cut-throat industry. So how does SlickVPN official website rank? First of all, it looks reasonably good. And SlickVPN has made it very easy for users to navigate. By that, we mean that you can find most of the helpful information present on the site within a couple of clicks. Moreover, we also saw prominent links that explained what terms such as ciphers along with key strengths and protocols meant. That is always good since most users don’t know the meaning of these terms. The homepage of SlickVPN official website also neatly lists out the number of countries it offers for its VPN servers. Some VPN service providers try to hide such information and that is not a good sign. MOreover, SlickVPN also goes through the pain of explaining the situations in which users can ask the company for a refund. In other words, the conditions for a legitimate refund request. Yes, SlickVPN also has an official blog. It has information on current news about the state of VPN services in the world and related stories about the company as a service. 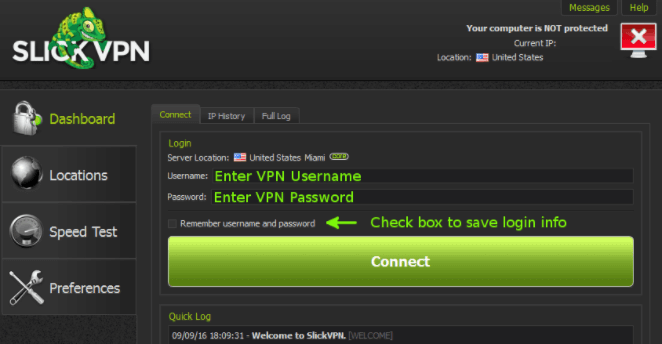 SlickVPN uses its blog to announce giveaways along with any upcoming competitions. Sometimes it also publishes longer (featured) articles teaching readers how to use a VPN service in order to enhance their online security. The navigation bar of the official website is not prominent enough. And even worse, all the important links such as that of the blog, Accounts, Contact info are present on that same bar. It is very easy for users to miss that bar. And if they miss it, that means they’ll find it difficult to search for the answers to their questions. Moreover, the navigation bar is also not static. As soon as the user scrolls down a page of two it disappears from the screen. Hence even if a user didn’t miss the navigation bar but wants to return to it after he has scrolled down a page, then the user would have to scroll upwards all the way to the top before reaching the navigation bar again. As you can probably imagine, this is painful, to say the least. It is a time-wasting feature as well. Hopefully, SlickVPN will fix this issue soon enough. Of course, customer support is not as important as the quality of VPN servers or features list. But it is a must if a VPN service provider wants to make it big in the VPN industry. VPN service providers without customer support tend to get lesser customers because potential users would want to sign up for another VPN service provider that does have customer support. Even if users don’t want to use the customer support feature they still want the VPN service provider to have that feature regardless. It is a bit like your video game library. You have tons of games that you want in your library but only play a few of them time and time again. What we mean by that is just because users don’t use a particular feature often enough doesn’t mean it doesn’t deserve much attention. Lucky for SlickVPN, the company has 24/7 customer support. The bad part about that 24/7 customer support is that it comes as a ticket-based solution. Moreover, the only way to access this customer support is via the accounts area once users have logged in. There is no live chat support either. As mentioned before, without the login details you can’t even access its ticketing system. The ticketing system itself isn’t all that great, to begin with. Most of the times you have to send a ticket that describes your problem to the company. And then you have to wait for the company to contact you afterward. SlickVPN doesn’t take too long to respond to queries but in a world where IPVanish and NordVPN exist, one needs to have live chat support available in order to compete with them. Our research for this SlickVPN review tells us that you can expect company representatives to be polite. Moreover, also expect a knowledgeable and helpful individual answering your questions from the other end of the communication line. The customer support department of SlickVPN doesn’t give off that vibe where users feel they are like a burden to the staff. As mentioned before, we would love for SlickVPN to introduce a live chat feature. Some customers want to ask informal questions before they begin to think about purchasing a package. And you need live chat support to get those customers. Otherwise, they would just run away. Probably to the VPN service provider that does have live chat support. More like, web resources, right? Well, the official website has decent setup guides for users to take advantage of. And you should expect to get in trouble the first time you are trying to set up a VPN service. It is not as easy a task as some VPN service providers make it out to be. As far as another reference material is concerned, there isn’t much of anything on the official website. Customers with slightly difficult questions or issues will have to contact the customer support department via the ticketing system because we didn’t see much help on the official website. Before we talk about the installation process let’s start the process with the signup process. Because that’s where you’ll start no matter which VPN service provider you chose in the future. We have already alluded to the fact that signing up with SlickVPN is pretty straightforward. And that holds true for almost all modern VPN service providers. Probably because they want customers to sign up as quickly as possible before they change their mind and sign up for one of their competitors. To sign up with SlickVPN you have to choose a subscription plan. Then you have to choose a payment method. After that, the website asks you to enter your email address. SlickVPN uses this email address to register and give you your new account. Moreover, you’ll also have to provide SlickVPN with a password. Needless to say, you’ll use that password to log in once you have downloaded and installed SlickVPN on your computer machine. AS mentioned before as well, you can choose to pay with Bitcoin as well. SlickVPN also has the PayPal option. 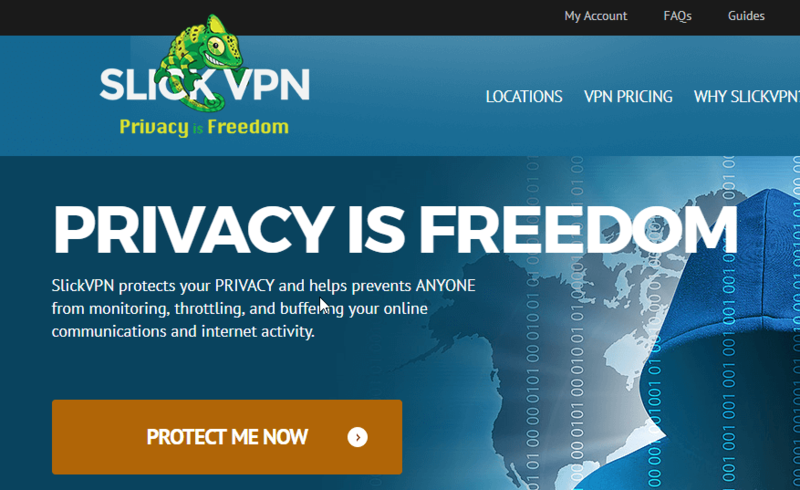 So you should sail smoothly as far as paying for SlickVPN is concerned. Well, SlickVPN will send the new user a confirmation/welcome email. This email will include the user’s login details. The user will have to use these details to make their VPN service work. Moreover, the welcome email will also come with related links that will guide the user on how to start the process of downloading the VPN client and use the VPN service. If you happen to run into trouble while installing SlickVPN then the welcome email would come in handy as it would have all the feedback and tutorial links. It doesn’t encrypt your password and sends it straight to you in the welcome email. The best course of action in such a scenario is to change your password the first time you log in to your account on SlickVPN. Right off the bat, we’ll tell you that SlickVPN has a powerful and feature rich Windows Client. It uses the OpenVPN protocol by default. If you want to connect to SlickVPN VPN service then that is an easy task. Just click the big, and wide, Connect button in the middle of your client window. SlickVPN has also made it easy for users to find all the options that its client offers. Moreover, the company also has web tutorials to show users how to connect to their service in the best possible manner. You have to first add VPN servers to a, kind of, group profile. Only after that can you use these servers. If you don’t care about the geographical location of your VPN server and just want to connect then this setting can help you do that much quicker. In other words, you won’t have to waste time selecting your favorite VPN servers which are the fastest. But remember, this would only work if you don’t care about the location of your VPN server. Most of the users want to connect to a VPN server that is located in the US because of a variety of reasons. For such type of users, this setting would not help. Of course, if you don’t care where in the United States the SlickVPN client connects you to as long as you can watch US Netflix, then too, this setting would help you. 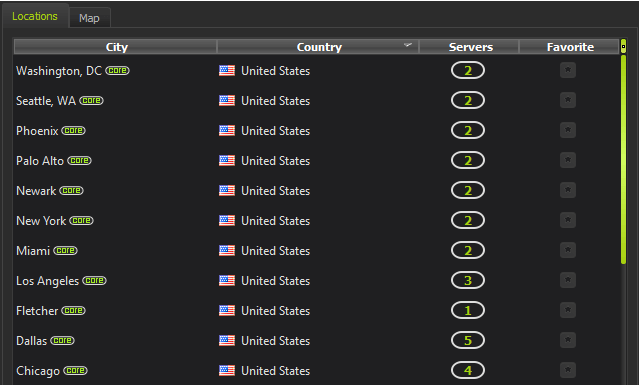 The SlickVPN Windows client also has an auto-group feature along with a balancing feature. You can found all of these in the preferences tab. These features combine well with the feature we mentioned in the previous section to allow users to comfortably connect to a variety of servers. A user could just want to connect to a server that is physically closest to his/her location because of speed. A user may want to connect to a server that has the least amount of load for more reliability. SlickVPN takes care of all these users by making sure they don’t have to expend extra effort to connect to their preferred servers. There is downside to such features as well. Well, it adds that dreaded additional layer of complexity. Users don’t want to click a lot before they connect to their favorite server. But with this setup, a user has to click a lot if he/she wants to connect to a particular VPN server that is located at a particular location. From an overall perspective though, the SlickVPN Windows Client has enough features to make life comfortable for all types of users. We told you before that SlickVPN had a feature-rich and a robust Windows client. If you go to the preferences menu, the client will reveal several different useful features. You have this option to start the SlickVPN Windows client as soon as your operating system boots up. Moreover, it also has the option to actually connect to a server as soon as you start your operating system. Additionally, it has two very important features in the form of IP and DNS leak protection. You can find these options in the Network tab from the preferences menu. SlickVPN Windows client also shows the user a warning message is the user has a Windows setup that may cause harmful DNS leaks. If users want to learn about these settings via basic instructions then SlickVPN client has content for that as well. This will help you resolve any of your VPN-related issues. All of this is indeed pleasing. But, SlickVPN could have scored a lot more points if it had programmed its client to provide a powerful DNS leak protection feature which would have rendered such steps redundant. The options menu of SlickVPN Windows client also has arrangements for users to connect via UDP or TCP. You can also choose your favorite port number if you happen to have one. A VPN service must work with a variety of network setups. For example, if should not stop working when you connect it to a public WiFi hotspot. The company’s Windows client has an option for users to add an extra layer of security along with privacy and anonymity. That option basically enables a user to change his/her IP address after fixed time intervals. And the client does that automatically without any user input. Advanced users also have lots of options to look forward to in SlickVPN client. Well, the client has options for users to specify their own OpenVPN parameters. This feature is indeed nice. And when you combine that with the connection log information that the client displays on the main menu tab, then it makes SlickVPN client even more accomplished. What’s The “Bad” Regarding The Windows Client? Or rather, sometimes it can give you problems when you try to input something at random times. Overall though, we think that SlickVPN has produced a rather decent software product. It makes the process of connecting to a VPN server painless and simple. Do you want to know how to test your VPN service provider’s speed? After that, do it several times. Then do it another time for a server that is closest to you. After all that, average out the results. So what did our research tell us? It told us that SlickVPN has VPN servers that give you consistent performance. Because they do sometimes give you issues while connecting to any number of servers. Moreover, we also notice that you might have an unresponsive and/or sluggish client once it experiences some errors. Generally speaking though, SlickVPN client connected to VPN servers quickly. In terms of pure speed, we found that SlickVPN VPN servers had high speeds on average. We didn’t notice any significant speed loss either. As expected, our research told us that if you want to experience the best speed possible then connect to VPN servers located in the US. Consistency in high speed along with rare dropped connections, make SlickVPN a high performing VPN service provider. What About DNS And IP Leaks? Our research shows that SlickVPN client took care of everything well enough. As mentioned before, the SlickVPN client has this feature where it warns the user if it detects that the user is susceptible to any leak. Then it guides the user in a direction that would help the user fix the problem. The client also comes with the standard WebRTC protection. The powerful SlickVPN Window client has no compatibility problems with Windows and Mac OS X.
SlickVPN doesn’t have dedicated apps for mobile platforms though. Or for any other platforms other than the two we mentioned above. And if you don’t want to use its default client on Windows and Mac OS X then SlickVPN has setup guides for a manual setup on these operating systems as well. The guides themselves are reasonably detailed. They have illustrations and a step-by-step format which makes everything more manageable. You can also find tutorials for manually using different protocols, so there is that as well. Should you go with SlickVPN as your primary VPN service provider? SlickVPN has lots of features for a VPN service provider, although we wouldn’t call any of those features as advanced features. But it still has enough on offer. 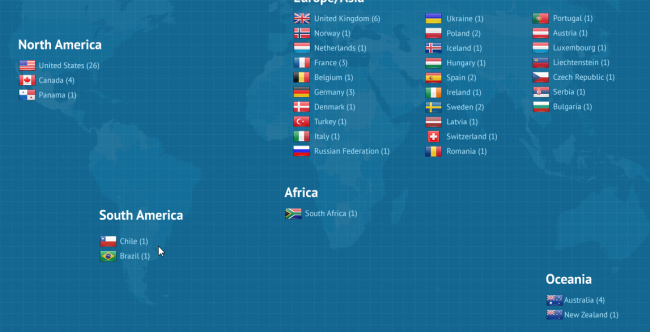 It has a decent number of VPN servers and a good variety of locations. Its Windows client is solid and the VPN servers themselves offer high speeds. Moreover, the company gives a lot of attention to the privacy and anonymity of its customers. That’s why it uses measures such as Bitcoin as a payment method and a Warrant Canary page. Compared to other VPN service providers, SlickVPN is cheap in its pricing. And it has a mammoth 30-day money-back guarantee to further facilitate users. SlickVPN has some obvious flaws too. It doesn’t have dedicated apps for mobile platforms. Moreover, while the client is simple to use, it can take some time for users to set it up properly. In the end, SlickVPN is definitely worth a try.